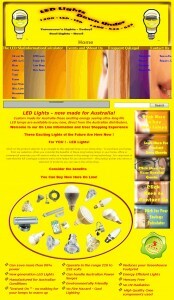 In those days, there really wasn’t a lot of resources around to assist you in creating a visually pleasing web site. Even Microsoft Frontpage was only something over the horizon, and most web page creation was done in text editors (yes, I can hear the purists out there crying that REAL web site creation is STILL done in Notepad – not this little black duck). Now there’s WordPress and Theme libraries and there’s really no excuse for ugly web site (my old Infinidim.org site notwithstanding …). Which brings me to the subject of today’s post. Yesterday Meg and I went to the Home Show. If that doesn’t give you some idea of how desperate we’ve become for a night on the town, nothing will. Two of three kids on Camp, the oldest home studying for IB, we were off for a night on the town. One of the stalls we came across was LED Lights Down Under. Meg has been looking for these for some lights she bought from Etsy – Husbands if your wives are reading this article pray God she doesn’t click on that link. 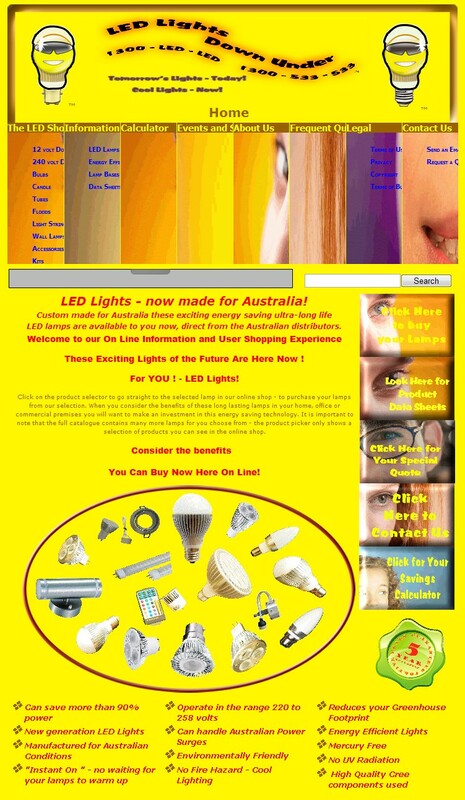 Anyway, LED Lights Down Under have a web site – and what a web site it is. Now don’t get me wrong – the stall was manned by two gentlemen – one of whom had driven down from Brisbane for the event – who were extremely helpful and offered us a discount on the spot. Since one of Meg’s purchases is going to require 20+ of these bulbs, and since she’s going to use LED lights in the pelmuts she’s planning in our renovated kitchen – that’s good news for me. But the web site, oh the web site. For starters, you need sunglasses to view it. Then someone clever has used (Flash?) to move the panels and forth – many of which serve no purpose at all. The form required for ordering was excessively demanding and intolerant of minor omissions of data entry – perniciously so. And the Yellow, the Yellow. Has anyone else come across a web site they’d like to share?